Oxygenation of activated sludge tanks is the process of adding air into wastewater so that pollutant components can allow aerobic bio-degradation. This process is an integral part of biological wastewater treatment systems. Biological treatment of wastewater uses microorganisms to degrade contaminants naturally unlike chemical treatment which can be harmful to the environment. Wastewater purification uses vacuum pumps to pump air into a sludge tank which then promotes microbial growth in the wastewater. 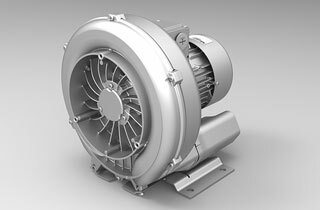 At Airtech Vacuum Incorporated, we offer high-tech regenerative blowers which are custom designed to meet different industry applications. Oxygenation of activated sludge tanks helps to provide oxygen to bacteria found in wastewater. The bacteria help to treat and stabilize wastewater to allow biodegradation to occur. Without sufficient oxygen, bacteria cannot break down incoming organic matter faster enough which in turn can make wastewater treatment difficult and formation of odor occurs. At Airtech, we understand the importance of wastewater treatment to the environment. That is why we manufacture regenerative blowers that are powerful enough to provide sufficient oxygen to septic tanks to fasten the process of biodegradation. We take time to study different applications and our engineers custom design blowers that fit different applications depending on the size of sludge tanks. Why Choose Airtech Vacuum Incorporated For Wastewater Purification/Oxygenation of Activated Sludge Tanks? At Airtech Vacuum Incorporated, we have accumulated a massive wealth of experience to become the world leading full line manufacturer of a wide range of vacuum and pressure technologies. For more than 35 years we have provided the waste purification industry with stellar high pressure regenerative blowers to allow them to treat wastewater safely and effectively. We have a variety of ready to ship blowers which are available in our Atlanta and San Francisco warehouse facilities. When you place an order with us, we ensure fast delivery. You also have an option to consult our engineers who can work with you to custom design regenerative blowers that will suit your needs. Feel free to contact our representatives at any time for more information about our products. We are proud to announce that our products are ISO9001-2008, UL-, CE-, RoHS-, and CSA-certified meaning they are made to the highest standards. Take a look through our inventory for wastewater purification high pressure regenerative blowers and buy today at competitive prices.